The glider chair is relatively new, in comparison to the traditional nursery rocking chair, and has become very popular over the last few years. The horizontal, floating movement is effortless and relaxing - If you haven't rocked in a glider chair before - try it - you're in for a real treat! A nursery glider can cost you anywhere from $200 to more than $1500 if you choose some of the optional functions. Glider chairs and ottomans are available from many baby and furniture online outlets, in a variety of styles, at reasonable prices. When comparing the prices of various nursery gliders, remember to check whether pads and cushions are included in the price. If they're not, you can usually add at least another $100 to the price. Also find out whether or not the matching ottoman is included. If you have to buy this separately, it can cost you between $100 and $250 extra. Visit amazon.com. They have an absolutely huge selection! If your budget is restricted, check out the Angel Line, Storkcraft, and AFG Furniture lines for good value. But remember, the more expensive brands, such as, Dutailer, will tend to be more durable in terms of hinges and slides wearing out. Alternatively, check out our discount baby furniture page for other money saving ideas. 1. The Ottoman - These are usually available to match the glider that you choose. 2. Nursery Glider Chair Pads And Cushions - These are attached to the glider in most cases, however, if you choose a traditional rocker style glider, you may need to add rocking chair cushions for comfort. 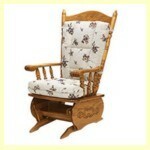 Go to our nursery rocking chairs page to read more about rocking chair cushions. Due to their ever-increasing popularity, not only in the nursery, but also in the bedroom, TV lounge etc., glider chairs are being produced in more and more different styles. Which one you prefer, will depend on your personal taste, just make sure it's comfortable. There are basically three different types of nursery glider, each available in various styles, with a number of optional, useful functions. 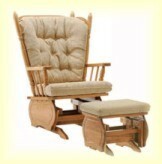 The traditional rocker style - These gliders are styled around the traditional nursery rocking chair. From the seat up, they look like a rocking chair, but they have the glider base instead of runners. The wooden glider style - These glider chairs have padded seats and backs. Some have padded armrests and wooden side panels. The upholstered glider style - These nursery gliders are completely upholstered from top to bottom, and are currently the top-selling glider chairs. They come in a wide range of fabrics including leather. The multi-position backrest - Choose which position is more comfortable for you. The reclining function - Very useful if you end up pulling night duty in the baby nursery with a colicky baby. Look for a wall-hugger if your nursery rocker will be near a wall. The wall hugger recliner only needs 4" of clearance from it to the wall, in order for it to fully recline! The swivel function - Not really necessary, but wonderful for changing baby's view, and, not to be over-looked, it has fantastic toddler entertainment value. The massage function - A great one for mom, but a bit pricey. Maybe you could use this one to persuade Dad to fill in for a few nights! If you are short on space in your baby nursery, look for a narrow, traditional nursery rocker or wooden style glider. A glider can be found in many different wood finishes and hundreds of different fabrics. The big disadvantage of a glider chair compared to a nursery rocking chair, is that the pads are not usually removable. This makes them difficult to clean and even more difficult to change. 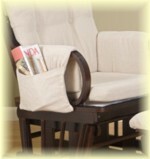 You can have the fabric of your glider chair professionally treated for stain resistance. This is not recommended for a nursery glider, however, as the chemicals used in the treatment will off-gas, potentially harming your baby. Your baby nursery furniture will get dirty - no matter how hard you try to keep it spotless! Bear in mind that marks are less visible on dark fabrics. Buy a washable slip cover for your glider if you can. (For example, these are available from Little Castle Inc for some of their upholstered chairs.) These covers can be removed and machine washed or dry-cleaned. If you can't find one to buy you can always have one made. Some glider manufactures sell replacement cushions for their glider chairs, e.g. Dutailer. Find out if the manufacturer of the glider chair you choose does the same - This is something worth knowing in advance of a bouncy toddler orange juice spill! Are you planning to use this glider chair in another nursery later, or are you going to leave it in this room as baby becomes a toddler? Will you move it to another room when your nursing days are over? If so, consider a chair covering that will fit in with other potential decor schemes - perhaps a neutral color would be best? Your nursery glider has the potential to become the most well-loved spot in your home - and not just by you. You can safely bet that the chair you buy now will be well used by your growing family through the years. It's well worth taking a little time to make sure you buy a good quality, relaxing chair. 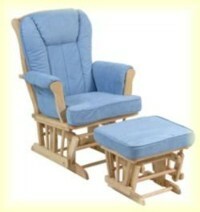 A nursery glider chair should be sturdy and well made. Make sure that all wooden surfaces are smooth to the touch. If you are buying a wooden glider, choose one made of hardwood such as maple or oak. Softwoods dent and mark easily, whereas a chair made from hardwood has the potential to look good for years. Your legs should reach the ground comfortably. The armrests should be at a comfortable height and long enough to support the full length of your arm. There is nothing worse than having to interrupt those precious, blissful moments of bonding, because you have a sore neck. The back should be high enough to support your neck and head. Movement should be smooth. Check for a smooth, gliding movement all the way through the range of motion. No sticky spots. Slightly curved is best. Flat backrests soon give you a back-ache and no rest. It must support the middle and lower back while you are rocking. It should be inclined at the correct angle to distribute weight evenly to all parts of your body. You don't want certain parts of you going numb! Practice sitting down and getting up out of the chair you choose. Is it easy to get in and out of, or do you sink in too deep, and struggle to get up? Remember you will have a wriggling baby in your arms when you sit down and, hopefully, a sleeping baby when you get up. Getting up with no hands can be quite a challenge if you don't have the right chair. If your rocker does not have padding, a thick blanket thrown over the armrest will also do the trick. A nursing pillow also helps. 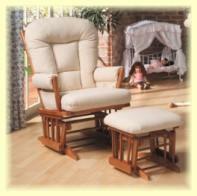 Most nursery glider chairs have padded armrests. Since you will be supporting an ever-increasingly heavy baby, (even newborns get heavy if you hold them for long enough), this is a feature you will come to appreciate. Check that the fabric you have chosen is soft and smooth. Rough fabric will chafe your skin and especially baby's. Some gliders also have handpockets on the outside of each arm. These are excellent for storing feeding supplies such as bibs, and for keeping some late-night reading material close at hand. As always, this should be your first priority in the baby nursery. For baby's safety, choose a nursery glider with wooden panels covering the sides. Curious, crawling babies will stick their fingers into any and every hole they can find. Wooden panels will prevent little fingers from being pinched or cut by the moving parts of the glider mechanism. Do you have a favorite nursery glider? Let us know and write a review of your glider chair. You'll receive a free ebook! Rocking in a nursery glider, with your precious little one cuddling up to you, is one of the most relaxing, and memorable experiences you will have as a mother. So, take your time, choose the right nursery glider, and look forward to many hours of snuggle-time.